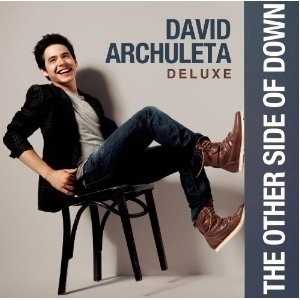 “Something ‘Bout Love”, the official first single by singer-songwriter David Archuleta from his second pop album, Other Side Of Down , was released on October 5, 2010. The music video for the song premiered on August 5, 2010. Declan Whitebloom directed the video who also directed Crush back in 2008. Something ‘Bout Love is an infectious up-tempo, modern heartfelt dance tune. This is exactly the type of song I love to hear on the radio a fresh upbeat tune that gets stuck in your head. Of course, David vocals you can always count on with a falsetto to die for. It has a techno flavor added in with a pulsating beat, and has a great melody. The lyrics give the song substance and as David promised in an interview with Billboard the songs on this album would contain more “lively grooves” than his previous album. Something ‘Bout Love was age appropriate, spoke about love but not overly sexual like many songs by artists today. It’s a toe tapping catchy tune one that you want to replay over and over again. David sang the song with great ease and style with quality and versatility. The song is easy to fall in love with. It’s a very inspiring song that can make you laugh and cry; a very soulful and expressive song that has the power to give you strength and hope. David is no lightweight he never loses touch with the source of the soul. The dimensions of David’s own musical intelligence are quite evident and you can detect more of him in the mix this time around. It achieved top 4 peak position at the Under Hot 100 and no. 48 at the US Pop Airplay. This single/video was the perfect song for David’s stunning vocals and the message that you shouldn’t give up on love is expressed in his emotions at every part of this song. While watching the YouTube video performances of “Something ‘Bout Love”, the first thing that immediately struck me about this number was its high degree of difficulty. Yes, it is a pop song and it is upbeat, fun and contagious, but that does not diminish the the broad range within melodic framework. The song switches back and forth from upper to lower range; yet, for the most part, it sits right smack in the upper part of David’s range. I could almost sense David’s little mind working as he meticulously navigated through his upper range with pitch perfect ease and clarity. His head voice during this number is absolutely spectacular, grounded by admirable diaphragmatic support. And, when he added some chest voice to the mix, his vocal delivery sounded rich and vibrant. He is such a master of vocal projection and, in this number, has managed to meticulously balance his technical skills in such a manner as to heighten his innate, soulful style. In both video performances, the passionate exuberance he exhibits on stage is just incredible. He is just so musical, his body moving freely to the rhythmic pulse of the music. Few artists can master the ability to fully immerse themselves in a song while maintaining control over their voice. David is one of those artists. And don’t even get me started on David’s immaculate approach to the diphthongs in his lyrics. You know – those syllables with more than one vowel, such as in the word “right“. Throughout the entire song, David employs the correct technical approach to these diphthongs, sustaining and focusing his voice on the first pure vowel. In the case of the “eye” diphthong, David sustains his voice on the first vowel – “ah” – and, thus, achieves perfect focus. In classical singing, this is called the bel canto approach and allows a singer to master an even, seamless sound throughout his or her singing range. Additionally, the pitch is preserved and centered, very clean sounding. Also, how I loved watching David’s connection to the crowd. He engaged the audience so very well, in such a playful manner. He has such respect for his audience and has so much love and joy to share. Such a huge heart! Also, I would like to give kudos to his back-up musicians and vocalists. They were absolutely spectacular and mirrored David’s gift for excellence. The harmonies, in particular, were “spot on”! And as much as I enjoyed this song, in the end, it was David’s excellent performance of this number, that made it so special. Yes, there’s “Something ‘Bout David” and it can be summed up in one word – Supercalifragilisticexpialidocious!!! Dear Roseann…..It is always such a great experience to read the thoughts of a true professional about David’s wonderfully gifted voice. Each and every time we hear him we are treated to an experience we feel so deeply….but can’t always explain. We just know we are moved to tears because of the beauty of what he reveals to us through his music. You give us so much insight into the expertise of this amazingly talented young man!!! He is truly one of a kind….and a blessing to behold! Thank you for taking the time to reflect on David’s music in such a loving ….yet insightful way. David is a “gift” that just keeps on “giving”! Thank you for your wonderful reviews! I just love your reviews. I am always in awe of David, but you know how to put it all in to words. Thank you so much for educating us on the beauty of David’s voice. I love the way he finishes every word so there is no doubt what he is actually saying. Some of the sloppy singing I hear on the radio drives me crazy. I am always asking my grandsons, “What did he say?”. Never with David. Thank You Pamela and Masterclasslady!! Love your review of Something ‘Bout Love!! Both of you explain so well why we love David’s singing. Also very excited about David’s new Album No Matter How Far due out March 26-One Year Anniversary of David’s Mission and only one year to go!! Pamela & Rosanne-Thank you so much for your amazing reviews regarding SBL. It’s certainly one of the finest tracks on David’s album. I think radio stations really missed the mark not giving this song lots of airplay! It’s got major hit written all over it! I remember David saying SBL was the most difficult one vocally for him to record. Gosh darn, I miss him soo much!! !